Unique partnership enables six massive seders around the African nation for the first time ever, with rabbis flown in from the US. The Jewish community in Nigeria celebrated a very special Passover this year. Thanks to a unique collaboration between the local Chabad and the EMI SYSTEMS LTD, Nigerian Security Company owned by Israeli businessman Eyal Mesika, a kosher Passover seder was held for the first time in six major cities across the African nation, led by American rabbis who were especially flown in. 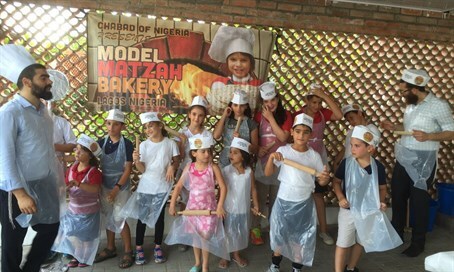 Over the course of the holiday, the rabbis are devoting their time to community activities with children of the Jewish community, teaching them about baking matzah and more. There are around 1,200 Jews living scattered across Nigeria, and on Passover eve another 280 Israelis were in the country working away from their families. Chabad every year sends American rabbis to organize a proper seder for the Jews in the country, in activities funded by EMI. This year, EMI's generous contribution allowed eight young rabbis from across the US to be flown in to Nigeria together with three Torah scrolls. During the intermediary days of Passover, the rabbis are working with the children in activities including matzah baking, tours and classes, and sending matzah to the Israelis around the country. Rabbi Yisrael Ozan, the Chabad delegate in Nigeria, said, "I'm happy and excited for the Passover holiday that symbolizes...the people of Israel (becoming) a collective. So it is very symbolic to formulate the Nigerian community together and celebrate in six locations in parallel with more than a thousand members of the local Jewish community." "I would like to congratulate the EMI SYSTEMS LTD and its Chairman, Mr. Eyal Mesika, for the significant contribution to the development and prosperity of the Jewish community in Nigeria in general and in particular during the holiday," said Rabbi Ozan, noting the seders would not have been possible otherwise. In response, Mesika said, "I am happy to help Chabad...and wish a happy Passover to all Jews and Israelis around the globe."